This is a very nice recipe during the cold winter and early spring months. The raisins add a nice sweetness to the meal. Cut the squash into bite-sized pieces. We use organic red kuri squash, so it is not necessary to remove the skin. If you don’t have a thin skinned organic squash, then also remove the skin. Prepare the kale by washing, then removing the large ribs/stems and chop into small pieces. Peel the ginger and grate or mince. Heat the oil or vegan margarine in a large frying pan or skillet. Add the pumpkin pieces and sauté until they begin to soften. Add the chopped onions and continue to sauté until the onions begin to become glassy. Add the rice, ginger and garlic and mix well to cover the grains evenly with the seasoned oil. Add the 1/2 cup of white wine and cook until the liquid has been absorbed. Add 3 cups of vegetable bouillon and continue cooking. Stir the mixture often while it is cooking. 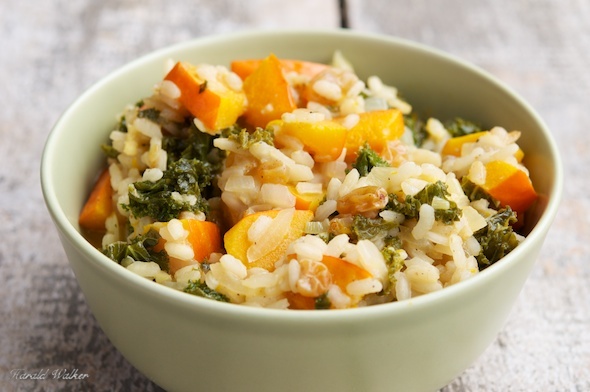 When the rice has become soft, add the kale. You may need to add the 4th cup of vegetable bouillon or water to continue cooking until the mixture is creamy and the grains are soft. Add the nutritional yeast and nutmeg. Season to taste with salt and pepper as needed. Serve warm with a whole grain bread. 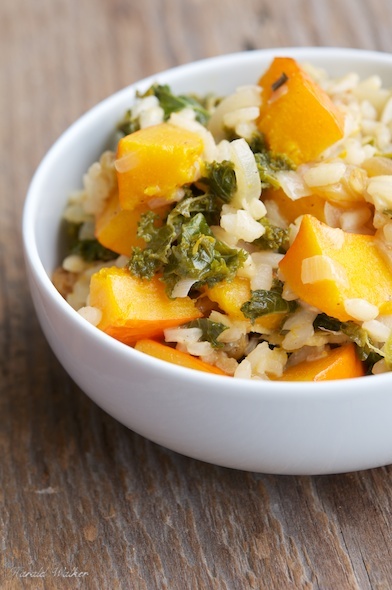 Posted by Chris Walker on March 19, 2013 in Kale, Main Dishes, Raisins, Rice, Squash.